(Blooming Prairie, MN March 2018) – As they prepare to kick off 2018 in a big way, the Minimizer Bandit Big Rig Series faces larger expectations amid a growing field of competitors. 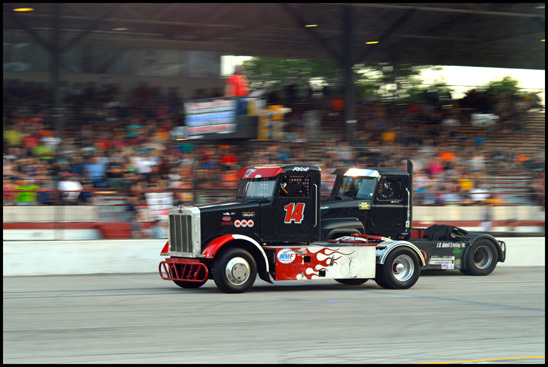 More tracks, more trucks and more Bandits have organizers excited about the season. "This is going to be huge," The Godfather Craig Kruckeberg said. "We have more Bandits trying to steal the $50,000 purse, so fans can expect more races and more action at each event." "I can't wait to see the fan turnout at Mobile," General Manager Jason Johnson said. "We've seen a ton of pre-order tickets and the excitement is off the charts." The Bandits start the season at Mobile International Speedway on March 10th . Fans that can't attend that or any other race can watch the live stream on the Bandit Facebook page or the Bandit YouTube channel. "The Facebook page continues to blow up," Kruckeberg said. "We're adding boatloads of fans by the day. It's great to see so much interest in the Bandits." After an inaugural season that saw numerous sellouts and surpassed initial expectations, Johnson says the plan is to grow the series and make new fans. "Most of the tracks on the 2018 schedule are new to us, because we want to introduce the Bandits to as many new fans as possible," Johnson said. "And that all starts with the season opener at Mobile." The Bandit Series recently launched a new website to correspond with the season opener. "The website looks amazing," Johnson said. "We're really taking things up a notch in 2018." After the season opener at Mobile, the Bandit Big Rig Series heads to Hickory Motor Speedway in North Carolina. "That's one of the few tracks that we're going back to this year," Johnson said. "It's a legendary track and the turnout last year was awesome. We're hoping for another sellout on April 7th ."